9 Printable Sewing Cheat Sheets - Peek-a-Boo Pages - Patterns, Fabric & More! There are so many little pieces of information that it would be nice to have right at my fingertips while I am sewing. 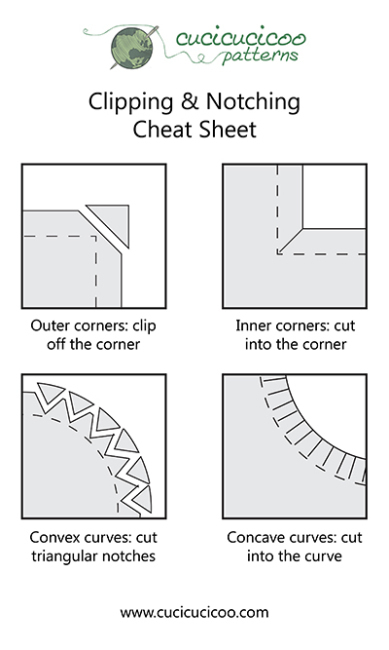 I have found several sewing cheat sheets that you can print out for free and have right on hand to save you time and effort, leaving you more time to create beautiful things! 1. This printable from This Pilgrim Life is a great for the beginning sewist as a reminder of basic sewing terms and techniques. 2. Is your fabric a different width from that called for in the pattern? 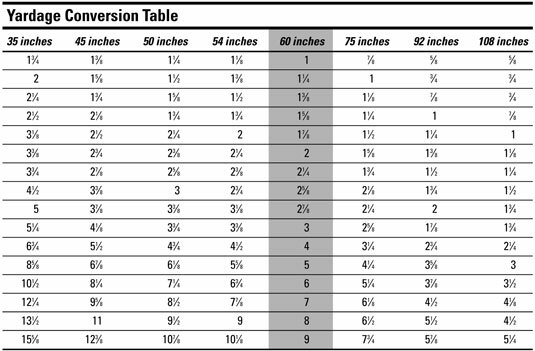 This printable from dummies.com will make converting the yardage requirements a cinch. 3. Have trouble remembering when to notch and where to clip? This guide from Cucicucicoo will help you keep it straight. 4. 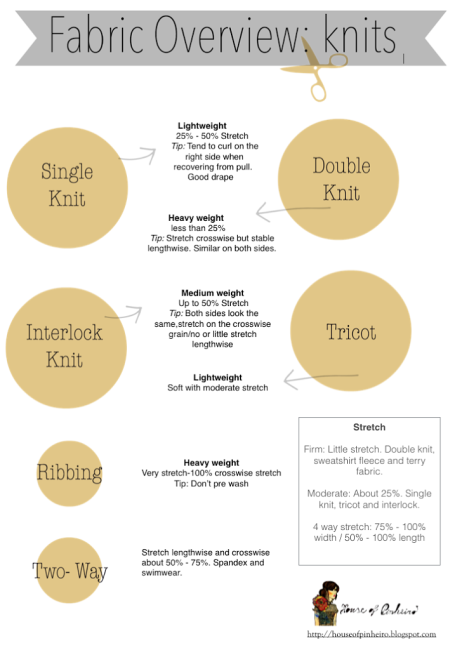 This reference guide from House of Pinheiro has good info on different types of knits. 5. Calculating fabric requirements for making bias tape can be tricky. This printable from The Sewing Loft has a formula to make it simple. 6. Caring for your fabric properly is important to preserve the quality of the items you sew. 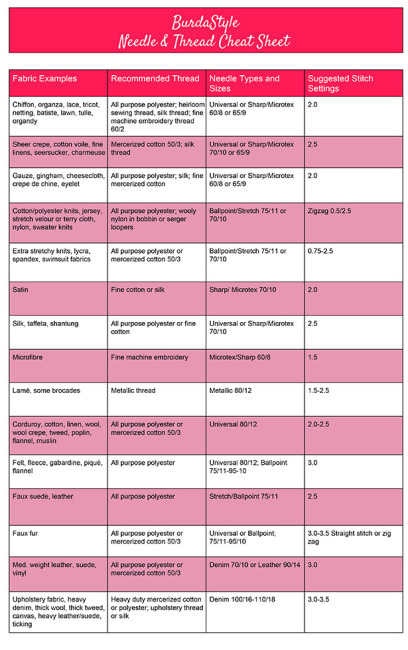 This cheat sheet from Scarves.com has all the info you need on fabric care. 7. This cute card from Everyday Celebrate helps convert from yards to inches easily. 8. I love this printable from Burda Style with info on choosing needles and thread for different fabrics. 9. Have you ever thought of keeping a sewing journal to help keep track of what went well and what you would change about each project? You end up with a cheat sheet for future use. Sew Mama Sew has a free printable to get you started. Thank you so much! I especially like the Sewing Journal. I have been sewing my entire life, MANY years LOL, and never thought about doing this, Great idea, and I plan to start today. Thank you for the various cheat sheets! They all look like issues that will help me. An area I would love to find help with is concerning neckline interfacing. For some reason I just can’t figure out patterns and what they’re saying to do. Has anyone found something that is helpful in this area? Thanks for sharing my cheat sheet!